The coin marks time passed since the first of the two great wars between Romans and Dacians. The first took place between 101 and 102 and the second in 106. They are so important to the Romanians because the two led finally to the complete destruction of Dacia as Dacian state and further to the birth of the Romanian people as inheritant of both combatant nations. The Roman emperor pictured on the reverse is Trajan, the one fighting the wars and finally prevailing. On the obverse a great work of art and monument still residing in one of the Rome's places of today is depicted, the Column of Trajan the emperor errected as memento of the conquest of Dacia. Also Decebal, the defeated king of the Dacians, is pictured next to Trajan. Their sided effigies were and are a common motive in Romanian symbolism and appeared on banknotes too. Along Burebista, Decebal is the greatest political leader of the Dacians, both having ruled over a territory roughly coresponding to the present day territories of Romania and the Republic of Moldavia altogether and even larger. 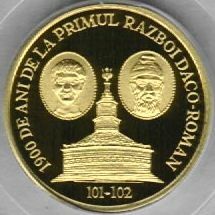 The monument pictured on the reverse is Tropaeum Trajani, a monument risen next to the nowadays village of Adamclisi, in the region of Dobrogea, Romania, by the same emperor as reminder of the first war with the Dacians. The restored monument resides even today for visitors to see, dating back from 109. This coin is not the only having Dacia and the Dacians as subject. In 1983 Romania struck a set of four - two silver and two golden coins - celebrating 2050 years since the political union of the Dacians into a single state. 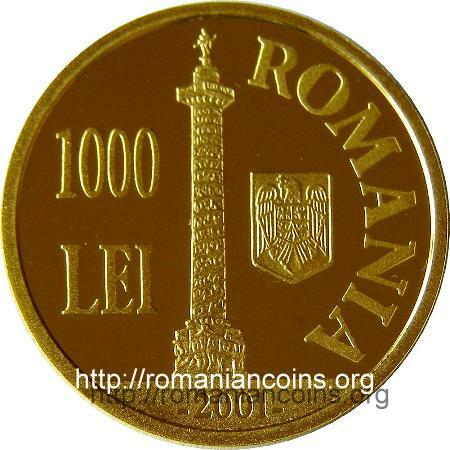 Click here to see one of the two 500 lei gold coins or click here for the 1000 lei from 1983. In anul 2009 was struck a 10 lei silver coin dedicated to the anniversation of 1900 years since the inauguration of Tropaeum Traiani. 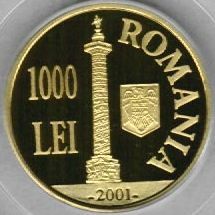 The pictures of the first coin above are present on Romanian coins through the kind permission of Mr. J. Ardelean. 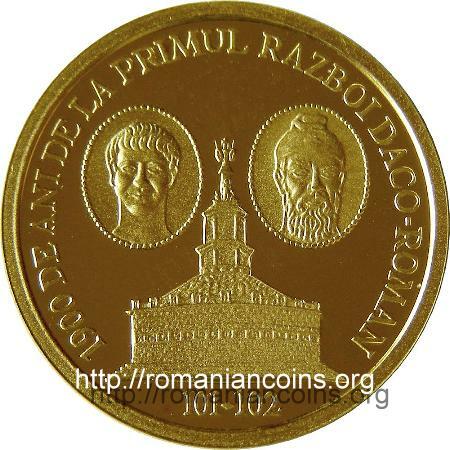 The second gold coin pictures above are present on Romanian coins through the kind permission of an anonymous donor.